Spanish-sponsored explorers discovered both the leeward (Alonso de Ojeda, 1499) and windward (Christopher Columbus, 1493) island groups. However, the Spanish Crown only founded settlements in the Leeward Islands. In the 17th century the islands were conquered by the Dutch West India Company and colonized by Dutch settlers. From the last quarter of the 17th century, the group consisted of six Dutch islands: Curaçao (settled in 1634), Aruba (settled in 1636), Bonaire (settled in 1636), Sint Eustatius (settled in 1636), Saba (settled in 1640) and Sint Maarten (settled in 1648). 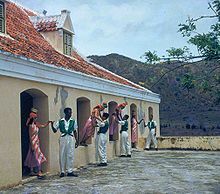 In the past, Anguilla (1631–1650), the present-day British Virgin Islands (1612–1672), St. Croix and Tobago had also been Dutch. During the American Revolution Sint Eustatius, along with Curaçao, was a major trade center in the Caribbean, with Sint Eustatius a major source of supplies for the Thirteen Colonies. It had been called “the Golden Rock” because of the number of wealthy merchants and volume of trade there. The British sacked its only town, Oranjestad, in 1781 and the economy of the island never recovered. Unlike many other regions, few immigrants went to the Dutch islands, due to the weak economy. However, with the discovery of oil in Venezuela in the nineteenth century, British-Dutch Shell Oil Company established refineries in Curaçao, while the U.S. processed Venezuelan crude oil in Aruba. This resulted in booming economies on the two islands, which turned to bust in the 1980s when oil refineries were closed. The various islands were united as a single country — the Netherlands Antilles — in 1954, under the Dutch crown. The country was dissolved on 10 October 2010. Curaçao and Sint Maarten became distinct constituent countries alongside Aruba which had become a distinct constituent country in 1986; whereas Bonaire, Sint Eustatius, and Saba (the “BES Islands”) became special municipalities within the Netherlands proper. In May 1948 a new constitution for the territory entered into force, allowing the largest amount of autonomy possible under the Dutch constitution of 1922. Among other things, universal suffrage was introduced. The territory was also renamed “Netherlands Antilles”. After the Dutch constitution was revised in 1948, a new interim Constitution of the Netherlands Antilles was enacted in February 1951. Shortly afterwards, on 3 March 1951, the Island Regulation of the Netherlands Antilles (Dutch: Eilandenregeling Nederlandse Antillen or ERNA) was issued by royal decree, giving fairly wide autonomy to the various island territories in the Netherlands Antilles. A consolidated version of this regulation remained in force until the dissolution of the Netherlands Antilles in 2010. On 26 November 2005, a Round Table Conference (RTC) was held between the governments of the Netherlands, Aruba, the Netherlands Antilles, and each island in the Netherlands Antilles. The final statement to emerge from the RTC stated that autonomy for Curaçao and Sint Maarten, plus a new status for Bonaire, Sint Eustatius, and Saba (BES) would come into effect by 1 July 2007. On 12 October 2006, the Netherlands reached an agreement with Bonaire, Sint Eustatius, and Saba: this agreement would make these islands special municipalities. The acts of parliament integrating the “BES” islands (Bonaire, Sint Eustatius and Saba) into the Netherlands were given royal assent on 17 May 2010. After ratification by the Netherlands (6 July), the Netherlands Antilles (20 August), and Aruba (4 September), the Kingdom act amending the Charter for the Kingdom of the Netherlands with regard to the dissolution of the Netherlands Antilles was signed by the three countries in the closing Round Table Conference on 9 September 2010 in The Hague. After a decades-long debate, English and Papiamentu were made official languages alongside Dutch in early March 2007. Legislation was produced in Dutch, but parliamentary debate was in Papiamentu or English, depending on the island. Due to a massive influx of immigrants from Spanish-speaking territories such as the Dominican Republic in the Windward Islands, and increased tourism from Venezuela in the Leeward Islands, Spanish had also become increasingly used. Most Netherlands Antilleans were Dutch citizens and this status permitted and encouraged the young and university-educated to emigrate to the Netherlands. This exodus was considered to be to the islands’ detriment, as it created a brain drain. On the other hand, immigrants from the Dominican Republic, Haiti, the Anglophone Caribbean and Colombia had increased their presence on these islands in later years. Tourism and overwhelming media presence from the United States increased the regional United States influence. On all the islands, the holiday of Carnival had become an important event after its importation from other Caribbean and Latin American countries in the 1960s. Festivities included “jump-up” parades with beautifully colored costumes, floats, and live bands as well as beauty contests and other competitions. Carnival on the islands also included a middle-of-the-night j’ouvert (juvé) parade that ended at sunrise with the burning of a straw King Momo, cleansing the island of sins and bad luck. ^ “Landsverordening officiële talen”. decentrale.regelgeving.overheid.nl. 28 March 2007. Retrieved 5 January 2011. ^ a b “Status change means Dutch Antilles no longer exists”. BBC News. BBC. 10 October 2010. Retrieved 11 October 2010. 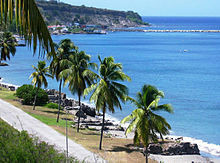 ^ “Visa for the Dutch Caribbean”. Netherlands embassy in the United Kingdom. Retrieved 7 May 2013. ^ Albert Gastmann, “Suriname and the Dutch in the Caribbean” in Encyclopedia of Latin American History and Culture, vol. 5, p. 189. New York: Charles Scribner’s Sons 1996. ^ “Antillen opgeheven op 10-10-2010” (in Dutch). NOS[clarification needed]. 1 October 2009. Retrieved 1 October 2009. ^ “Closing statement of the first Round Table Conference”. Ministry of the Interior and Kingdom Relations. 26 November 2005. Retrieved 19 July 2011. ^ Radio Netherlands (12 October 2006). “Caribbean islands become Dutch municipalities”. Archived from the original on 13 December 2006. Retrieved 2 February 2007. ^ “Curaçao and St Maarten to have country status”. Government.nl. 3 November 2006. Retrieved 21 January 2008. ^ “Curacao rejects final agreement”. Ministry of the Interior and Kingdom Relations. 29 November 2006. Archived from the original on 30 September 2007. Retrieved 2 February 2007. ^ “Curaçao verwerpt slotakkoord”. Nu.nl. Retrieved 10 October 2010. ^ The Daily Herald St. Maarten (9 July 2007). “Curaçao IC ratifies November 2 accord”. Archived from the original on 11 July 2007. Retrieved 13 July 2007. ^ “Netherlands Antilles no more”. Stabroek News. Retrieved 10 October 2010. ^ “Antilles allow Papiamentu as official language”, The Times Hague/Amsterdam/Rotterdam, 9 March 2007, page 2. ^ “FIDE Directory – Netherlands Antilles”. FIDE. ^ Rob Gollin (23 February 1998). “Koraalspecht is het ergst, zeggen zelfs Colombiaanse gevangenen” (in Dutch). de Volkskrant. Retrieved 6 October 2013. ^ “Chavez Says Holland Plans to Help US Invade Venezuela”. Spiegel.de. 11 April 2006. Retrieved 10 October 2010. “Netherlands Antilles”. The World Factbook. Central Intelligence Agency.